With a young and growing population, together with rapid growth in urbanization and industrialization, Saudi Arabia is expected to maintain its position as the Middle East’s largest construction market. Demand is on the rise for industrial properties, including industrial cities and logistic facilities, and transportation and utilities projects are also being planned. Having declined by 2.5% in 2016 amid the impact of lower oil production, weaker economic growth, and fiscal consolidation measures, the infrastructure sector is expected to rebound in 2017 due to higher infrastructure spending and a resumption of government payments to contractors. 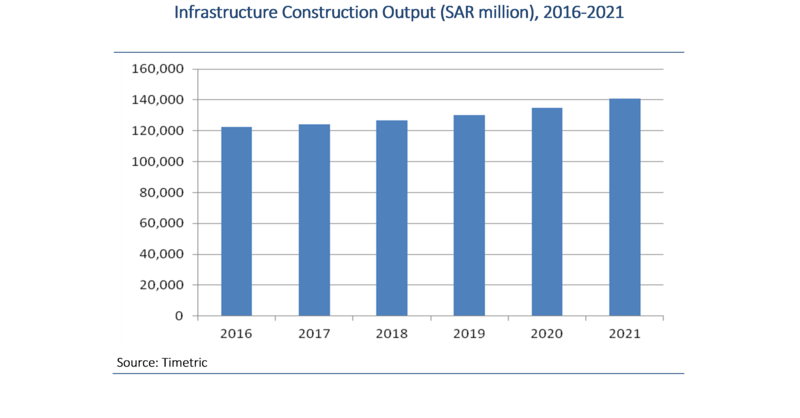 According to Timetric’s Infrastructure Intelligence Center (IIC), the infrastructure construction market’s value is projected to reach SAR124 billion (US$33.1 billion) in 2017 and SAR140.8 billion (US$37.5 billion) by 2021 (in nominal value terms). This is based on the assumption that a number of large-scale projects will proceed as planned, including a number of transport projects such as the Riyadh Metro, the Makkah Metro and the King Abdulaziz International Airport Expansion. The IIC is currently tracking 111 strategic infrastructure construction projects in Saudi Arabia. These projects have a total investment value of US$446.7 billion. About 68% of the projects will be funded directly by the public sector, 25.6% will be financed by a mix of public and private funding mechanisms while the remainder (6.7%) will be funded by the private sector. In April 2016, the Saudi government launched ‘Saudi Vision 2030’, a strategy that includes various economic and social policies as well as objectives, and commitments aimed at ensuring the continuous development of the country, while reducing Saudi Arabia’s reliance on oil revenues and government spending. Under the vision, the government seeks to drive the non-oil economy and stimulate private investment in state activities. A few months after announcing the vision, the government published the National Transformation Program 2020 (NTP 2020), setting out a number of targets under which it expects to achieve its medium-term goals of Saudi Vision 2030. In the 2017 budget, SAR52 billion (US$13.9 billion) has been allocated for the infrastructure and transport sector, a 39% increase from the actual level in 2016. This includes projects, programs and several new initiatives to develop roads, ports, railways, airports, postal services, and the industrial cities in Jubail and Yanbu and Ras Al Khair Industrial Mining. The budget also includes additional funding for NTP initiatives, which is estimated at SAR42 billion (US$11.2 billion). In January 2017, the government announced three public transport projects in the port city of Jeddah, an indication that a freeze on new infrastructure projects in the Kingdom may be easing as the government slows its austerity measures. These projects include a tramline along Jeddah’s northern cornice, a marine taxi service and a bridge that will link two areas of the city. Furthermore, a report by consultants Faithful+Gould published early this year, estimates that projects awards for 2017 could rise from US$27 billion to US$32 billion if the Makkah Metro Project, which was expected to be awarded in 2016, goes through this year. However, a large budget deficit, weak economic growth, low oil prices, ongoing regional tensions, and uncertainty over the future implementation of the reform agenda present major downside risks to the outlook of the infrastructure sector. While a potential increase in oil prices and debt issuance will support government revenues, subsidy cuts and the introduction of higher taxes next year could limit the country’s growth and ultimately impact on the expansion of the sector. In addition, there remain concerns over further major cuts to the Saudi infrastructure project pipeline as Saudi Arabia’s National Project Management Organization looks to make spending efficiencies. In January 2017, the Saudi government awarded a contract to PwC to identify between SAR50 billion (US$13.3 billion) and SAR75 billion (US$20 billion) in savings on infrastructure projects as part of its cost-cutting measures to narrow the large budget deficit and achieve a balanced budget by 2020. The government also ordered its ministries and agencies in April 2017 to review billions of dollars worth of unfinished infrastructure and economic development projects to either call them off or restructure them to make them more efficient. The Infrastructure IC is the most comprehensive source of data and analysis on the global infrastructure industry. For more information and updates, please visit www.infrastructure-ic.com/. Timetric is a leading provider of online data, analysis and advisory services on key financial and industry sectors. It provides integrated information services covering risk assessments, forecasts, industry analysis, market intelligence, news and commentary. Enquiries relating to obtaining this report should be directed to reports@timetric.com or call +44 (0) 20 3096 5763.